The space shuttle Columbia took potato plants into space in 1995. This was the first time that food was grown in space. One of the strangest wars in history was the Bavarian War of Succession or The Great Potato War. The war began in 1778 and ended in 1779. The war was between Prussia and Austria. When Maximilian Joseph died he had no heirs leaving no ruler. Both the Prussian and the Austrians had claims to the land and wanted it for themselves. They sent huge armies to the area and carefully got them into strategic positions. What makes this war very strange is that there were no actual battles. The two forces spent their time blocking supply lines and raiding the other side for food. Both side were also forced to scavenge the area for food, soldiers claimed they spent more time searching for food (potatoes were the most common crop) than fighting, hence the name the Great Potato War. Potatoes were first brought to Europe in 1550 by Gonzalo Jimenez de Quesada. Sir Walter Raleigh is said to have introduced the potato to the Irish in 1585. In 2006 it was estimated by the UN that more than 315 trillion tonnes of potatoes were grown the previous year. Potatoes were not popular when they first arrived in Europe. In France one county deemed that potatoes were so dangerous that anyone caught growing them would be fined. In France the potato was accused of being the cause of, sterility, syphilis, narcosis, early death and leprosy. It was considered to be both dangerous and evil. The largest potato on record was 18 lbs 4 oz. The Church was suspicious of the potato because there is no mention of it in the Bible. Frederick the Great (1712 to 1786) encouraged his subjects to grow and eat potatoes, he even sent them free potatoes to start their crops. Frederick realised that potatoes were a hardy crop that could prevent future famines from occurring. The peasants were reluctant to have anything to do with the vegetables until Frederick began growing the potatoes in one of his royal gardens. Marie Antoinette helped to popularize the potato by appearing in public wearing potato blossoms. Potatoes first came to North America in 1621. The potatoes were sent to the Governor of Virginia (Francis Wyatt) by the Governor of Bermuda, Captain Nathanial Butler. 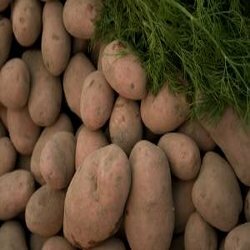 This entry was posted in Food Trivia and tagged fun potato facts, potao history trivia, Potato, potato facts, potato famine, potato famine trivia, potato history, Potato information, Potato trivia, potato war trivia by Jane. Bookmark the permalink.